Below you will find a collection of sprites, waiting and willing to carry you to one of my wonderful sibling sites. 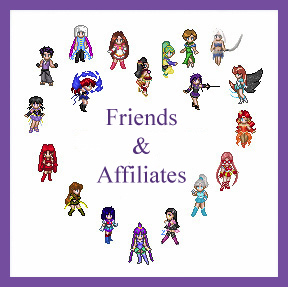 Each little sprite takes you to an affiliated site that I personally recommend. No matter who you click, you will be going somewhere cool! Please come by again soon! Here are some of my favorite places to hang out; I divided them into categories to help you out. Thanks for coming to SailorAstear.com! Hope you'll be back soon! In and Out of Darkness - This site has more artists than probably any otaku senshi art request site out there. If you are going to find someone to make an image for you, it will be here. A Breeze of Thunder - Among other things, the coloring book can be found in the activity center. Shades of Pink - Blanks of Chibiusa! Create Your Own Otaku Senshi - This all-inclusive site will help you learn about otaku senshi and give you a step by step guide on how to create your very own fan character! Ashleigh's Anime Abyss - Home of Sailor Universe and other great stuff by Ashleigh! BSSMShadows - Wild Nature's story and characters, with one completed season and a second coming to a close! Chibi Power, MAKE UP! - Go check out the future team of chibi senshi running amuk in Crystal Tokyo! Clockwork Revolution - Fanfiction featuring Sailor Solis, story for slightly more mature audiences due to language. Cosmos Devine - A BSSM otaku senshi fanfic based upon the future, where Sailor Cosmos is against Chaos and the key to fighting Chaos lay in two Goddesses. Egyptian Winds - The sun seemed a bit hot in Tokyo, Japan, when a strange wind current appeared in the Sol Senshi's quiet town...what is this disturbing wind? FLOWN a sailor moon story - Unlike any other fiction you have ever read. Frozen Fire: Liquid Flame - Meet Sailor Caloris, a soldier of unique origins. Genesis*Star - This otaku senshi based site features some really awesome Zodiac senshi. Incyanity - Home of "Crystal Memory" and Sailor Starfury, among lots more! The Ice Palace - A site featuring four new otaku senshi groups including the Amazon Senshi, Darkstar Senshi, The Sister Senshi, and all new Sailor Animamates! Palace of the Sun - Check out this newly revised BSSM fanfiction featuring some really stellar characters. Parallel Senshi - This story features Sailor Aeternus and her quest to find her teammates as she struggles with all the normal challenges of being a teen. Project: Sailor Earth - Not your ordinary Sailor Earth! Psychosis - A dark, mature fiction for more mature Sailor Moon fans. Reflections - This well-developed fiction follows the detailed history of senshi from another solar system and the troubles they face on their homeworlds and abroad. Sailor Christmas [dot] Com - This site contains stories, art and more about the specially chosen Sailor Warriors of Holidays (aka Holiday Senshi) within the Pretty Soldier Sailor Moon (Bishoujo Senshi Sailormoon) Reality; includes gallery and KISS dolls! Sailor Tiger's Grotto - A fanfiction site that created to be the home of Sailor Tiger, a feline senshi with more lives than a cat and just as many problems. A Scattering of Starseeds - Check out Andi's new teams of senshi! Fanfictions and galleries coming soon! Senshi no Danza - Three male senshi from a far off kingdom excape a violent past and arrive on Earth. Shangri-La - A slightly AU story which features a team of senshi not of the run-of-the-mill style. Shards of Phaeton - It's post-StarS and the senshi think they have it made. But of course, the peace cannot last. Suddenly, monsters start springing up again calling them false senshi! And a new soldier appears looking for some mysterious 'shards.' Shards of what?! This story, told in sprite format, is faced paced and entertaining, so check it out! Silver Spirit Spectrum - It's back! Sailor Silver Dragon has returned!! SMDescended - As the original soldiers fade into obscurity, eight new faces rise. How do you fight an enemy that only wants to find salvation? StarScouts - A unique new team of senshi with comedy, romance, and revenge on their minds. Tarnished Silver -Home to two fanfictions-in-progress, Absolution and Ripples in Time, involving multiple senshi, trans-dimensional travelling and time manipulation. Triad Senshi: Kousei no Ichidou - A new otaku senshi page run be Ree! The story takes place in modern times in Wisconsin but has roots in ancient history, so go check it out! Virtue Senshi - An urbanized Sailor Moon story. Some materials may not be suitable for all readers. Worlds Within - Read some great fanfiction and check out some original stories, too! On Wings of Hope - A really amazing fandub project to recapture the ended of the first season the way it was meant to be. WikiMoon - This is a growing Wiki for Sailor Moon which will become a great resource. You can help by becomming a member and working on the project. Sailor Moon Uncensored - An interesting look at the censorship issues of the English Sailor Moon translation and a guide to what was changed, as well as articles and opinions. Bunny's Tour Through the Silver Millennium - There is so much information here about Sailor Moon that your head will probably explode! A great reference, really dedicated and organized this site is more than worth your time to visit. Cosmos Gelidus Semotusque - Do you need to know stuff about Sailor Cosmos? This amazing site features many details on this interesting character and fully explains the last few scenes in the Sailor Stars Manga. If you have any doubts at all about anything in with the end of the BSSM manga, check out this site! Sakura gives it a two thumbs up approval for info! DIES GAUDII - One of the most detailed, well researched Sailor Moon information pages out there. Features articles on almost every Sailor Moon urban legend and rumor, as well as the ever-important Tomb of the Little Known Senshi Error Guide. The Oracle :: BSSM Encycopedia - A great resource of Sailor Moon information for all canons. The Legend of the Moonlight - This AU RPG is mature and Shoujo-ai themed. The Silver Millennium was upheld not by peace, but by powerful warriors. But what secrets lie hidden below their feet? Era of Darkness - EoD is more or less An AU Sailormoon RPG. What if Sailormoon fell in love with the wrong man? And what if that man was CHaos? A Gateway to Sailor Moon: Links to the Sailor Moon Universe - Exactly what it says! Links to Sailor Moon sites all over the 'net. Deep Submerge - A collective listing of sites that contain 'Sailor Moon Goodness' organized by category for your convenience. Magic Lessons - Lei's doll site with her awesome bases and dolls. Chiba (Just a Token Male) - A wonderful look into the sometimes underestimated and underappreciated Chiba Mamoru. PGSM Fanfiction - A growing archive of awesome PGSM-based fanfiction; a sub site of Kirari-PGSM. Sailor Chronos Fanfiction Page - Though it hasn't been updated in a year or so - this site is still a great collection of Sailor Moon fanfiction. Sailormoon Fanfiction Archive - A new but promising fanfiction archive which allows members to leave feedback! Submit your work today! The Sailor Site - This is a cute general page, but the real reason you should visit is the growing collection of Sailor Moon fanfiction. There are also profiles, awards to win, and some nice galleries. Beware of pop-ups; it's Angelfire hosted. Picture Perfect - This is an amzing gallery of beautiful PGSM desktop images. The rules are very easy to follow and the desktops are stunning. SailorLibra's Crystal Moon - Includes images of many BSSM characters as well as some web graphics and wallpapers. Cat Girl Island - Come visit Cat Girl Island, meet Mike Moon and all his purrrfect friends! Sailor Centauri's Magical Girl Fashions - Commission your very own magical girl costume! Forbidden Friuts - A collection of original fantasy novels; angels, demons, ancient evils, and romance all in one! Anime Power Generator - This generator will take into consideration up to four elements and pump out some anime attack names. Though sometimes scary, this tool might help you get some attack name ideas for your otaku senshi! Behind the Name - The Etymology and History of First Names - If you need some names and their meaning and where they came from this site is absolutely great for ideas. Sakura's "Real" Artwork - Want to see some of my non-anime art work? Check out this deviantART gallery! Sakura's Illustration - My other DeviantART account that has all of her fanart and requested images. Think! Baby Names - Another great reference for the meaning of names with multiple search options as well as search results that include related names and meanings.